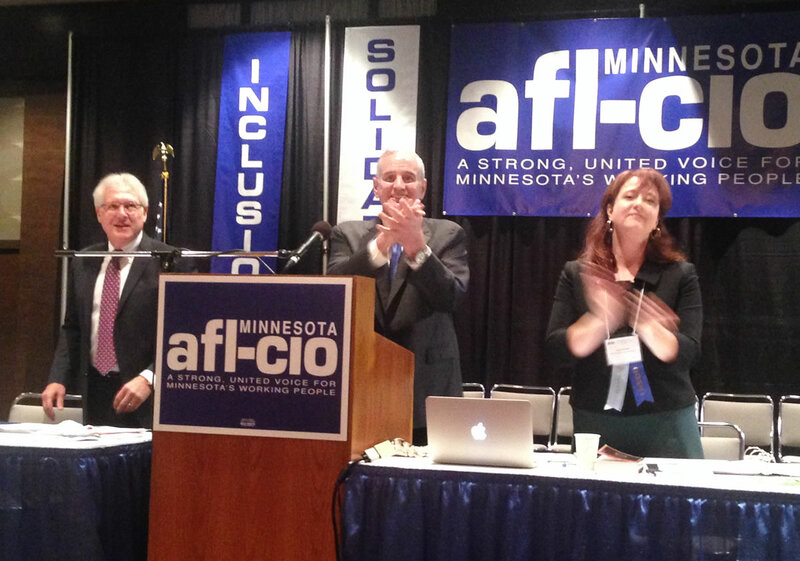 Governor Mark Dayton recounted his record in office to the Minnesota AFL-CIO convention Tuesday – and urged union members to turn out to vote Nov. 8. The importance of the November elections was a recurring theme at the labor federation’s biennial gathering, which ran from Sunday through Tuesday at the Duluth Entertainment & Convention Center. “Get out to vote because who gets elected really, really matters,” Duluth Mayor Emily Larson said as she opened the convention Sunday. Other speakers included Minnesota House Minority Leader Paul Thissen, Deputy Minority Leader Erin Murphy, Minnesota Secretary of State Steve Simon and St. Paul Mayor Chris Coleman. Dayton described his accomplishments during six years in office, including economic growth and progress on fair taxes and early childhood education. “I am most proud of what my administration has done to bring jobs to people,” the governor told the AFL-CIO delegates. He bemoaned the gridlock in the Republican-controlled Minnesota House that prevented action on tax, transportation and bonding bills. In addition to supporting the election of Democrat Hillary Clinton as president, the AFL-CIO and its affiliates have made it a top priority to elect DFL majorities in both houses of the Minnesota Legislature. The unions have organized Labor 2016 “Days of Action” around the state, with two more scheduled Oct. 1 and 15. Dayton thanked the federation and its affiliates for their efforts to work with him and advance an agenda for the common good. “I am deeply grateful to you for your strong, progressive and constructive leadership,” he said.